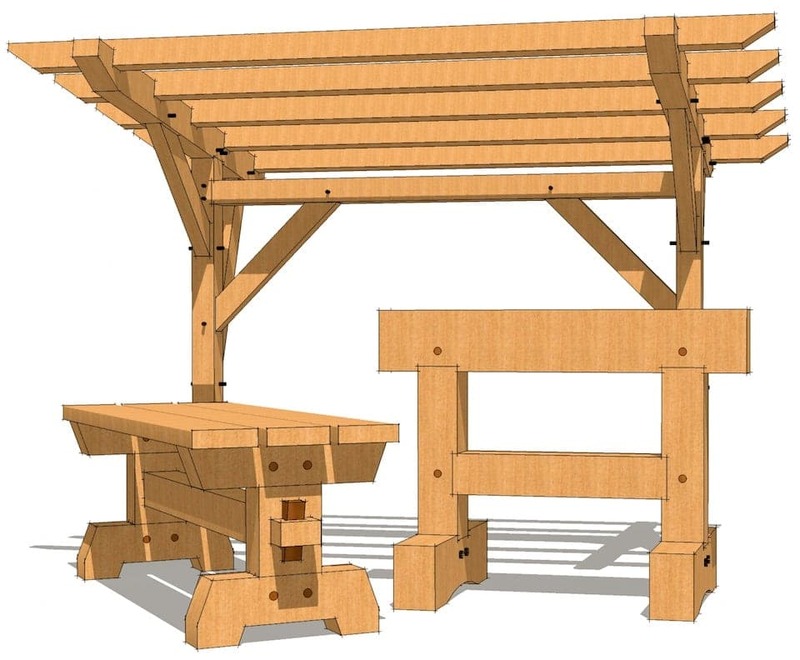 Get Your Hands on the timber frame sawhorse plans, an easy to build timbered bench and a cool cantilevered barbeque pergola. We respect your﻿ ﻿email privacy. Take a good look at this beautiful cantilevered timber frame pavilion! 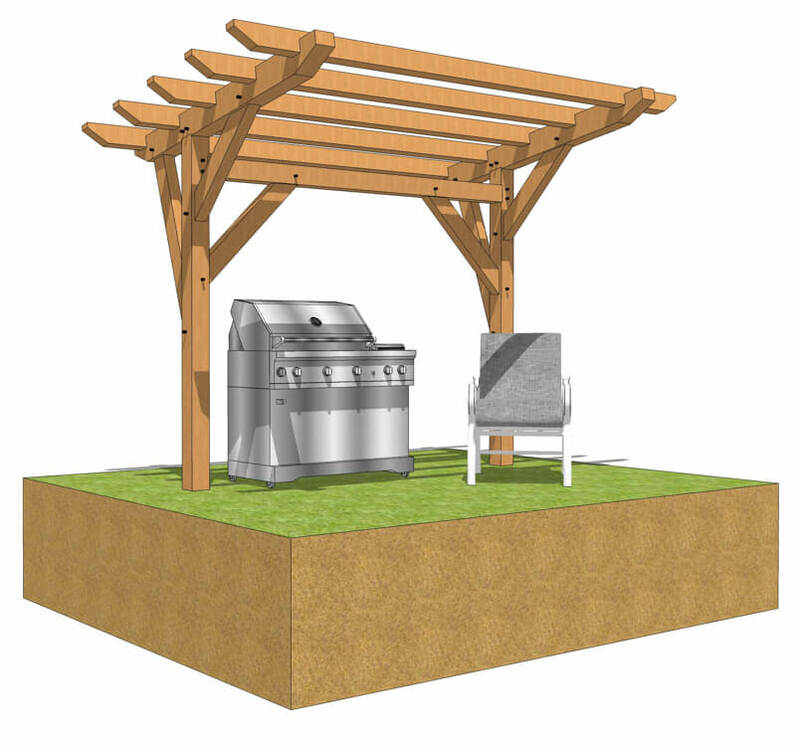 The cantilevered roof allows for plenty of room for a conversation area, outdoor kitchen, grill station, hot tub shelter or outdoor dining space. The low pitch cantilever creates an interesting, contemporary addition to your backyard. The strength in the cantilever comes from being sure the posts are secured deep into the ground.If you want to add even more privacy, you can add screening in between the posts and grow some climbing vines. The plan set prints on 8.5″x11″ and includes piece drawings for all the parts in the frame. 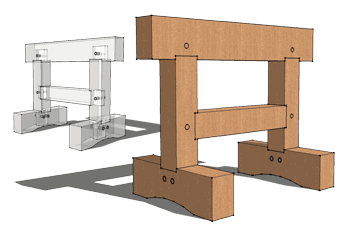 We have also included some blown up isometric drawings to help you visualize the joinery better. 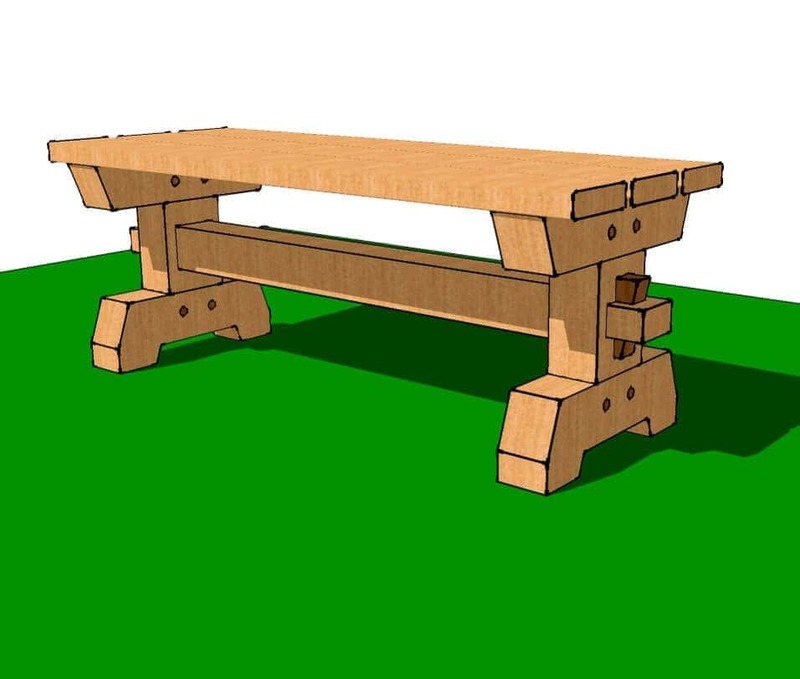 These timber frame garden bench plans are a great weekend project that is made extra special by the wedged tenon. Since the lumber pieces are on the small side, this could make a perfect beginning timber frame project. You will need a drill, 3/4" drill bit, circular saw, a chisel and some basic hand tools. All the materials are available at home centers unless you want to use another species of wood that they don't have. If you want a specific wood species, then heading to your local lumber supply house or your local sawmill will be your best bet. A great set of saw horses from Mike K. in CA. You will also get a copy of our Ebook 'Creating a Timber Frame House'. 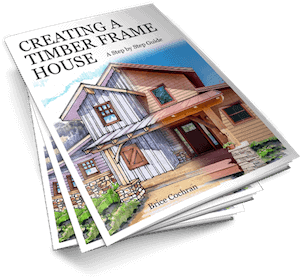 The goal of the book is to allow you to get familiar with the realities of building a timber frame home, and see if it’s all you thought it would be. I hope this book will clear up some misconceptions, answer some questions and describe the basic procedure that a family will go through in creating the house they can call home for generations.